Come face-to-face with Medusa the snake-haired goddess of Ancient Greek mythology and spin the wheel on 5 reels of online slot serpent madness. Explore the ominous ancient greek ruins and dodge flying arrows to match statues and Spartan helmets to earn yourself some free spins and significant cash rewards. Play the best online casino games. Looking through the extensive list of NextGen’s online gaming titles, the variety alone is evidence of their experience. With nearly 20 years in the industry, they have collectively grown their own, platform independent community of game developers, and fans. Big on entertainment, their online games are always of the highest quality, and playability. Medusa II takes us to the stormy beachside where a long history of brave men have landed, desperate to be the hero who returns from the island with the severed head of the Gorgon Queen herself. This is a place few ever return from - once they have gazed into her Gorgon eyes. We see a great deal of Medusa’s unlucky, but certainly once plucky foes who have long since turned into concrete relics on her island fortress. The Stone Victims, along with a Quiver of Arrows, a Gold Ring, a Bronze Helmet, and Golden Snakes, are the higher value symbols in this online slot, while 10 through Ace playing card symbols make up the lesser value symbols. The value of our coin in this 5 reel, 240 payline online slot can start at £0.02 and go all the way up to £4.00, and when we’ve funded a winning combo we will always have the option to choose the Hearts & Clubs gamble feature. This triggers a traditional, 2x to 4x accumulator based on guessing the colour or suit of cards, up to a maximum of 5 successful picks. The bigger money in the game, however, comes from landing the Scatters of Wilds – the Medusa II logo, or Medusa herself, respectively. 3 of the Scatters will trigger a Free Spins bonus round – which starts with 10 and can increase with an additional 5 when we continue to rack up the Scatters. Legend tells us that any man (or woman, presumably) who gazes into Medusa’s eyes, will immediately be turned to stone. And while we are lucky enough here to avoid that unfortunate end to our gaming lives, we are also fortunate to see Medusa turn entire reels into stone too. As the Wild, Medusa can substitute any other symbol than the Scatter, and can also appear as a stacked Wild. However, if one of the daring soldiers chooses to attack Medusa, her fiery glare will instantly turn the soldier to stone and create an entire stack of Wilds on that reel! What is really fun about this game is that because of the above bonus, we end up routing for the soldiers to be turned to stone – their loss is certainly our gain! 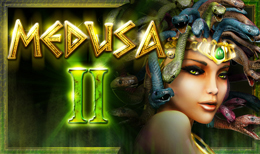 This NextGen sequel captures the essence of the original Medusa online slot, and adds a nice touch of originality, making it a unique game in itself. It’s simultaneously fun and quirky, despite being dark and mythical, making it a captivating game on several levels. It’s not often one can gaze into the alluring eyes of a Gorgon and live to tell the tale, but with NextGen’s latest in the series, we’ve actually managed to do it twice! 8/10. Play now!